This part is located in the lower part of the hand shower riser bar that passes through the rear glass wall of the shower or steam shower. 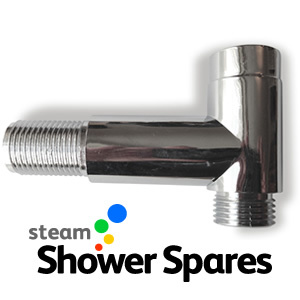 It enables a water feed connecion to the horizontal thread section and feed the water into the downward facing threaded section which is where the hand shower chrome hose would be fasterned. This part is as the type fitted to AquaLusso Alto and Opus Shower Cabins and Steam Showers. Designed for A-304 style hand shower riser bar.